DIY Media Cabinet Built-in - that looks great and hides everything! We're a family of nerds. We love technology and gadgets. They're fun to play and fiddle with. BUT, I'm the least nerdy of the nerds and I hate looking at all that mess. The chords and the boxes and the doodads. Blech. The visual clutter drives me batty. The last project we shared was a hidden TVcabinet (pictured above). This time we're hiding all the rest of the crap essential gadgets that plug into it. I wish we had a photo of this TV wall just before this unit was installed. It was like a black octopus with tentacles ending in other octopuses with tentacles. 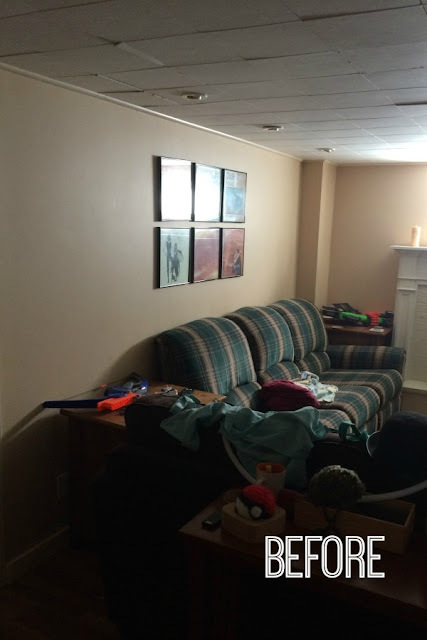 As you can see in this Before picture - this wall has a box on the one wall. It's here for the ductwork that heats the room. In order to create balance on this wall, we decided to mimic the same box on the other end of this wall. Here's Ed building the matching box - it's just 2x3s. We copied the same size exactly and wrapped both in faux brick panelling. You can also see that we covered the top half of this wall with faux brick panels too. 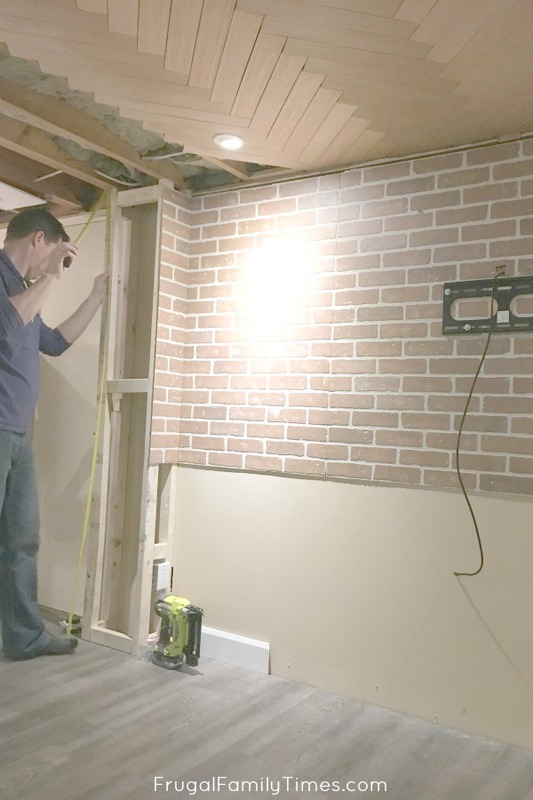 In our most boring of basements, we're adding texture and character in all the spots we can. Ed then used our faux bricks technique to make the fake brick panelling look real. It really works and couldn't be easier! Ed wishes that he did this step BEFORE we installed the brick panels. 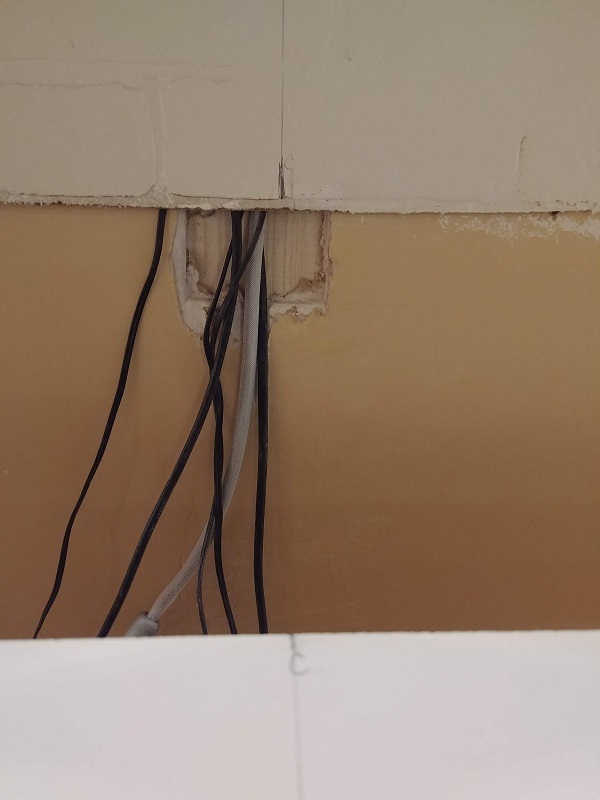 With some NSFW language, he retrofitted a groove in the drywall behind the panels. This meant that we could run the electronics wires from our DIY Hidden TV Cabinet to the media unit invisibly. He then cut a hole in the back of the middle media cabinet cupboard for the wires to poke through. It looks like a hot mess in this photo, but they are completely hidden. Centre and hang the middle cabinet. We got the whole family involved! 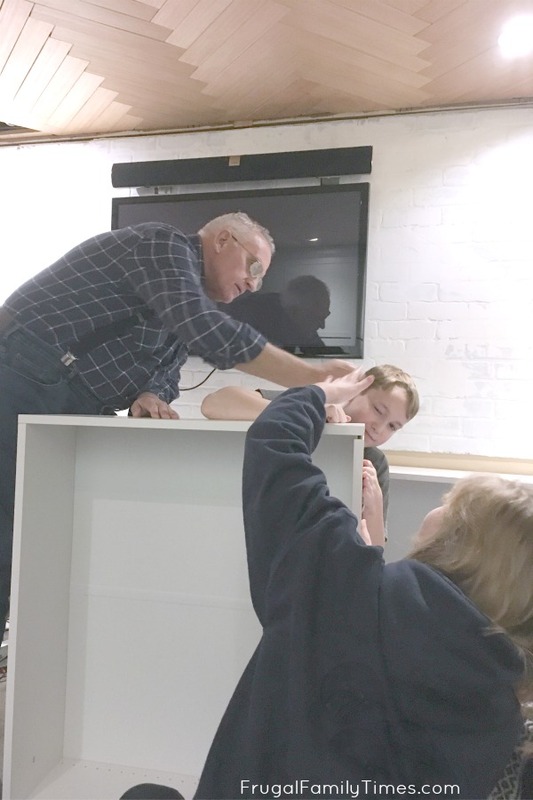 My dad and the kids assembled the three cabinets. 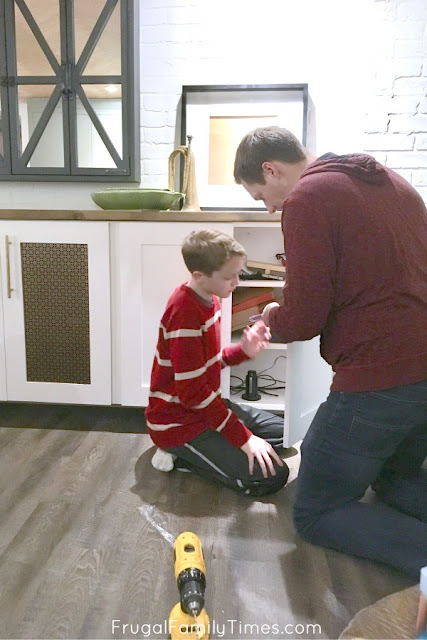 We love to recruit the kids into our projects whenever possible - it gives them skills and they really enjoy it and I think it gives them a bit of pride that they had a hand in something cool. My dad gets dragged into many of our projects, just by the fact that he's got mad DIY skills. We need him so much less than when we first bought our home - but he's roped into stuff when we're stuck. We're so thankful for him! 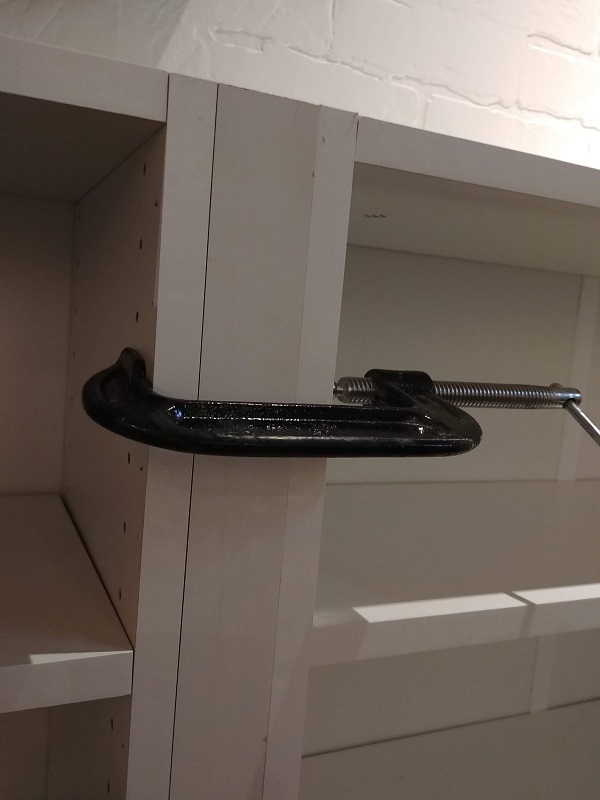 With the middle cabinet centred in the space and mounted to the wall with 4 screws into the studs, we worked our way out adding a spacer between the cabinets. 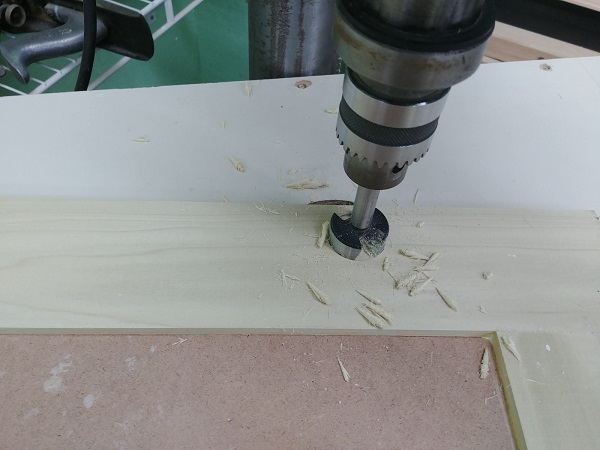 It was cut from a white melamine panel, clamped and nailed so it could be a straight edge for mounting to the next cabinet. Mount the cabinet to the wall. We used some spacers underneath to hold it to the right 'floating' height. We then clamped the two cabinets together, landmarked studs behind it and drilled 4 screws through the back to hold it in place. All of this was then repeated for the other side. Done! 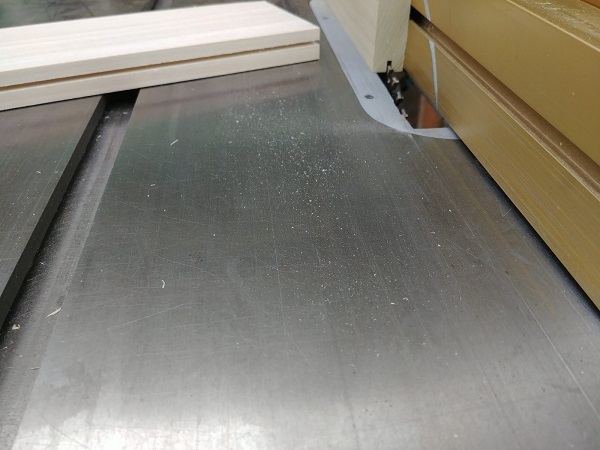 We decided to build our own doors after finding similar doors in-stock were over $70 each. Each! We needed six. 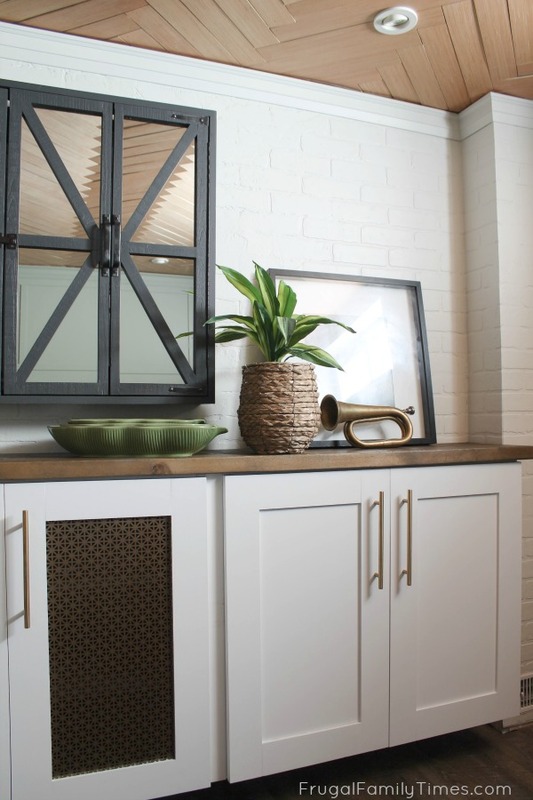 $420 for boring, basic doors = not.going.to.happen. The premade doors weren't going to be nearly as special. Ed used this tutorial to build the simple, Shaker style, solid doors for the side units. We won't repeat the same tutorial here, but below you'll find the steps for how we built the centre doors with metal inserts. These doors work amazing! I wanted to build doors that would hide the electronics but still let the remotes work. These metal inserts do exactly that, plus look pretty great. I bought two of this metal sheet. I chose the "Union Jack" pattern to complement the criss-cross design of our Hidden TV Cabinet. These sheets come in about a half dozen other patterns. We then gave both sides of the sheet a few light coats of this spray paint in Antique Brass. Prepare the frame for the Shaker door in the same way as the tutorial link describes. The one difference would be cutting the groove narrower for the metal panel than you normally would need to for a regular door. I found one pass through the table saw was all I needed width wise. 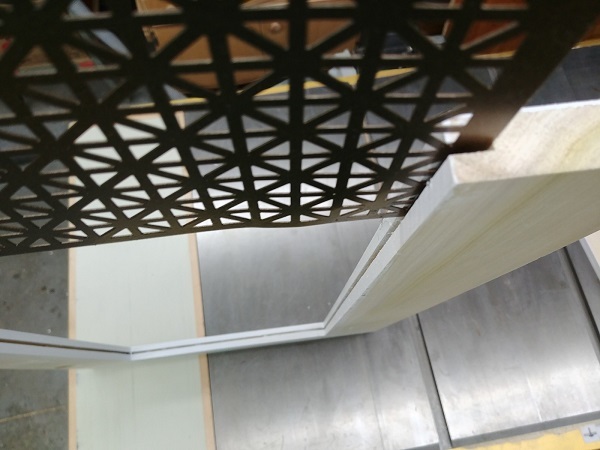 Depth is another story - If your doors are smaller than ours, you will likely need to cut the metal panel down a bit. Ours were so close to perfectly fitting the panel so I just cut the groove deeper. 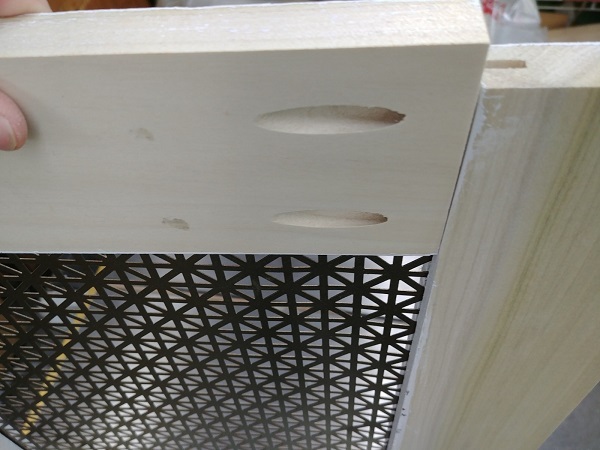 Go carefully and test fit - you don't want the groove too deep or it will make the metal panel loose in the frame. 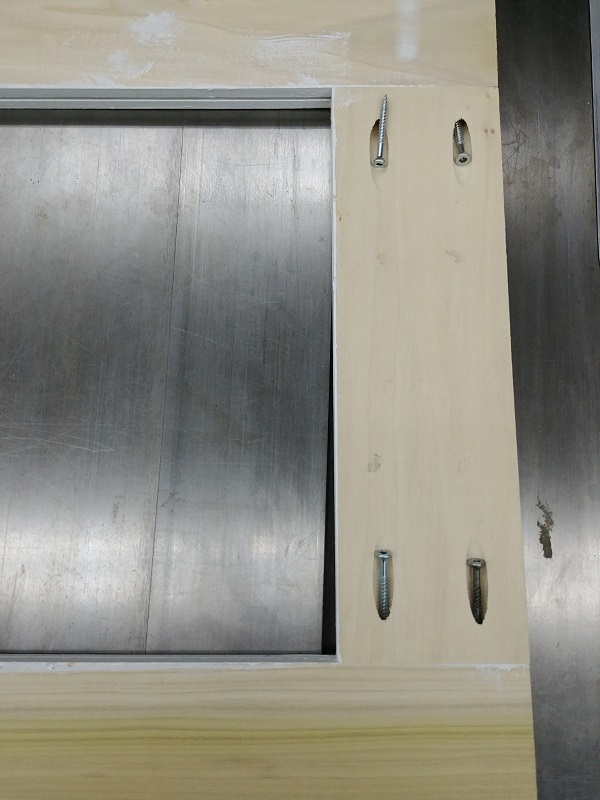 Assemble the door frame using a Kreg Jig and screws. This allows you to check everything for fit, paint the areas closest to the metal, then take it partially apart again to insert the metal sheet. Carefully slide the metal down the groove via the end you have open. Mine caught in a couple spots, but with some finesse and gentle prying, it went all the way in. Slide the last piece of the door back into place. Again, there may be some finicky messing around to get the metal into the groove, but it all works out. Clamp the door and drive the screws back into place. 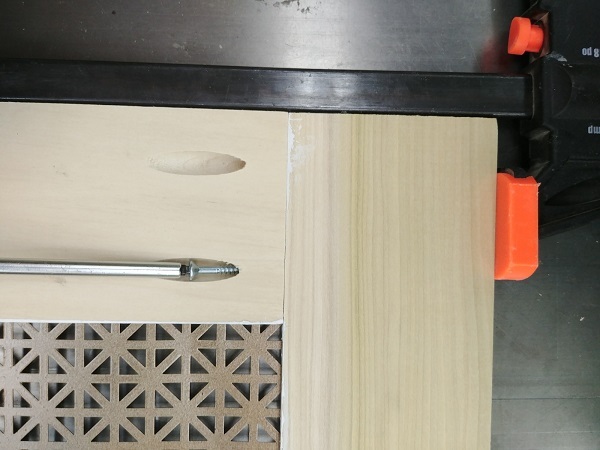 This is the only shot we had of using a Forstner bit to create the holes for the Euro hinges. 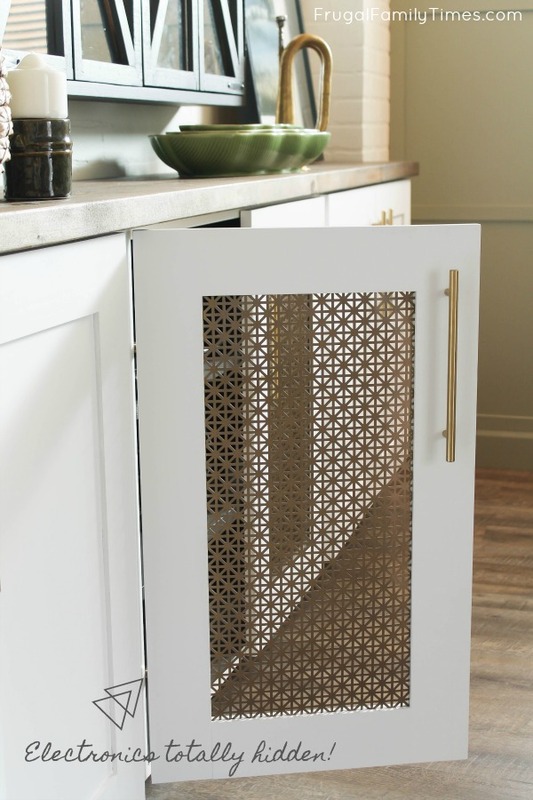 While this is showing a regular Shaker door, we did the same thing for the metal sheet insert ones. Bad bloggers! Bad. We have no shots of cutting the two 2"x8"s down to get a nice clean edge down the middle for joining them. You could use a table saw, circular saw or jointer/planer. We used all of them at some point. Our issue was a workshop with less than 20 feet of workspace and a ten-foot board to work with. 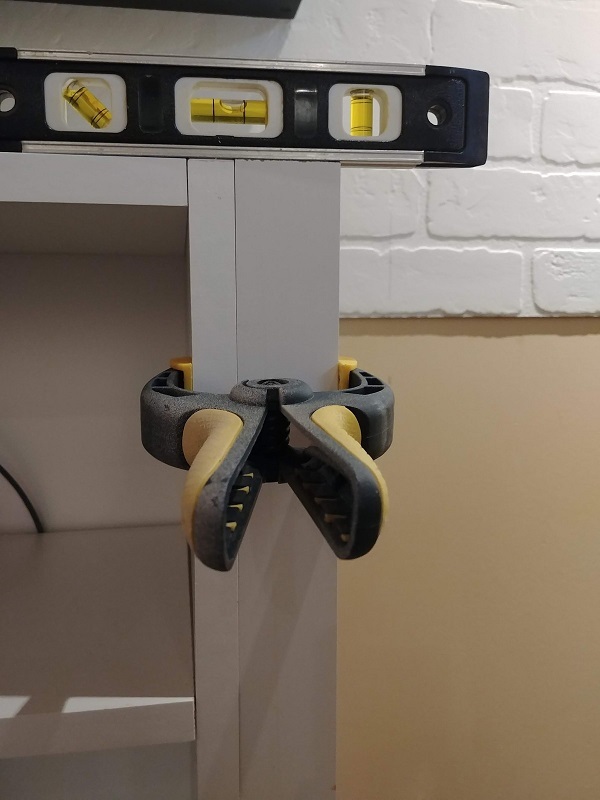 When we finally got two clean edges to join, we glued, clamped and then pocket screwed them together with our friend Kreg. After it dried we cut the newly joined board to length and lightly sanded it. We applied our favourite DIY reclaimed wood stain finish. 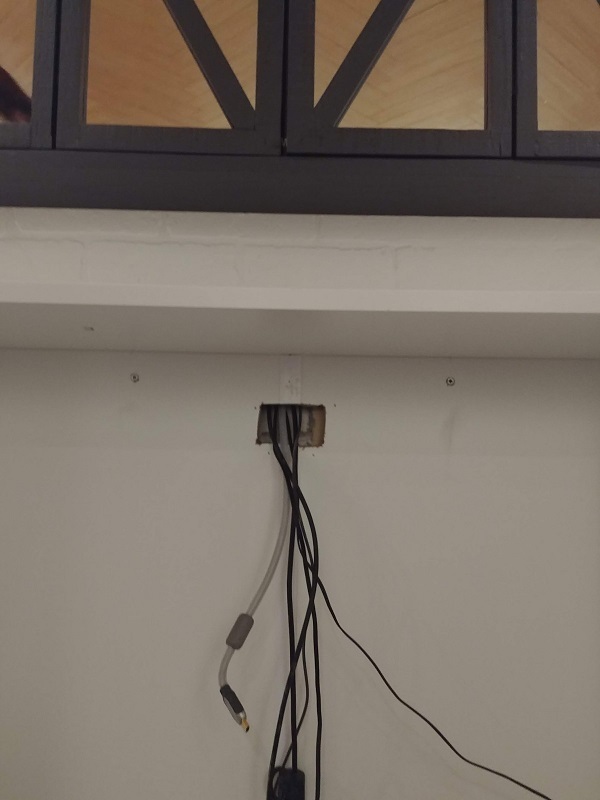 For the install, we attached it with screws from underneath the cabinet tops to hold it down. Our son helped Ed to install the hardware. I was really impressed with these brass-look pulls - they are super affordable and look and feel pretty legit. Can you see the electronics through the metal screen? Nope. The final trick we did was painting the inside of the centre cupboard and shelves with this dark paint . The mostly black media players blend in and are virtually hidden. 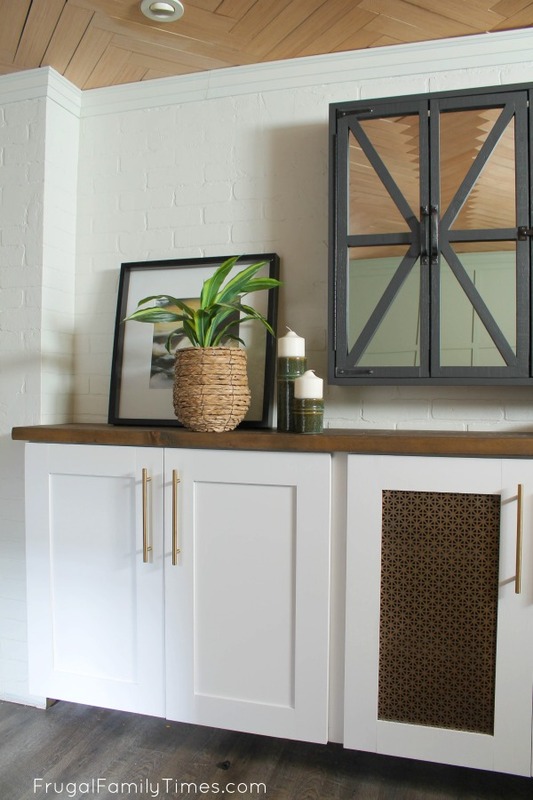 In the meantime, have you seen our other Basement Makeover Projects? We turned a closet into a basement bathroom (Featured in Better Homes and Gardens magazine!) & made the coziest guest room that doesn't feel like it's underground. I love this! It gives me an idea for my great room. 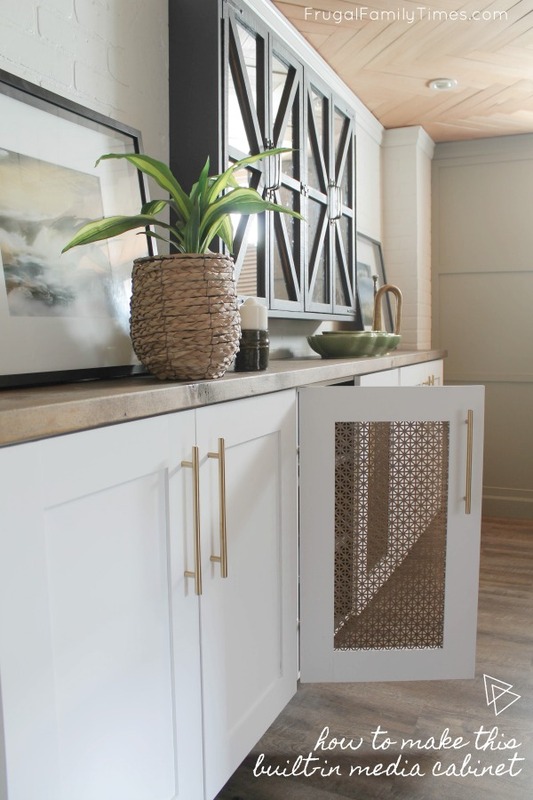 Also, very clever painting the cabinets dark on the inside, we've used the same wire mesh on a cabinet door but you could see everything inside and it looked awful. You have a great blog and you're full of wonderful ideas. Thank you for sharing them! THANK YOU SO MUCH, Amy!!! You made my day. 😊 I’m so happy you like our ideas and I’m thankful you took the time to let us know. Have fun with your great room project!